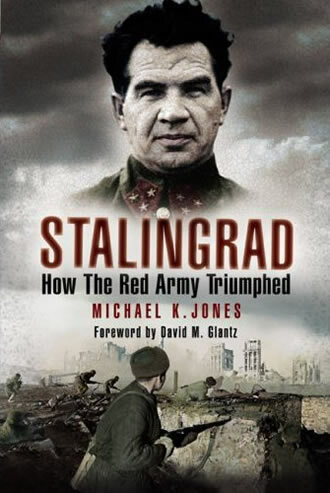 Stalingrad – How the Red Army Triumphed by Michael Jones, offers fresh insights and invaluable lessons into how defeat was turned into victory, not only in the face of overwhelming odds but also in direct conflict with Stalin. Hitler’s rise to power and eventual defeat may appear to some people as distant history. But for many, including myself, the nightmare of fascism was a shadow that hovered over my childhood as it had irrevocably altered the lives of my parents and grandparents. I heard from them how men had left for a distant front, never to return or how so many had suffered from hunger and homelessness during and after the war. People like my parents, who could read other languages and were widely travelled, were only too aware that much of what they were told by the Nazi state was lies and propaganda. In Britain and the US, the Soviet contribution to Hitler’s defeat has long been played down. Central in this lack of recognition was not only the sacrifice made by the people of the Soviet Union, but also how they defied the misleadership and repression of Stalin and his machine. Michael Jones’ book, based largely on the accounts of Soviet veterans, has the merit of setting the record straight in this important respect. 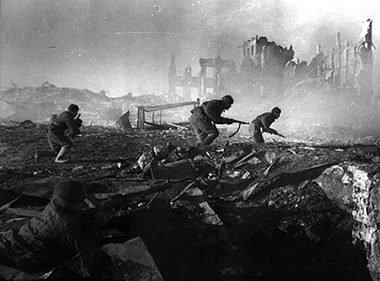 Stalingrad was probably the most momentous battle of the last century. It was and still is seen by many as the main turning point in the struggle to defeat Hitler’s armies, which until then had not tasted a major defeat. The battle occupied the minds and hearts of countless people around the world. In Britain, contemporary Home Office intelligence reports described public involvement in each turn of the conflict as an “obsession”. The battle for Stalingrad continues to fuel the imagination. 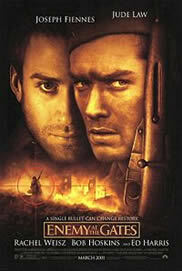 Jean-Jacques Annaud’s Enemy at the Gates (2001), starring Jude Law and Bob Hoskins, provided a romantic account of the conflict between a Soviet and German sniper against the background of the smouldering ruins of Stalingrad. Before that, British historian Antony Beevor’s book Stalingrad: the Fateful Siege 1942-1943 topped the best-seller lists. Joseph Vilsmair’s 1993 anti-war Stalingrad, a film about a group of soldiers shocked a new generation of Germans by re-enacting the battle through the experiences of a rank-and-file Wehrmacht soldier. Countless other books, websites, and even computer games have stimulated debate and discussion. Some of the myths have been debunked through these portrayals and the debates they have engendered. But even outstanding historians like Beevor (whose 560-page epic account incorporates many interviews with German and Russian survivors and makes use of the Russian document collections opened up by Gorbachev’s glasnost), are being challenged as still more secrets have surfaced. There is no doubt that there was a monumental miscalculation on the German side. 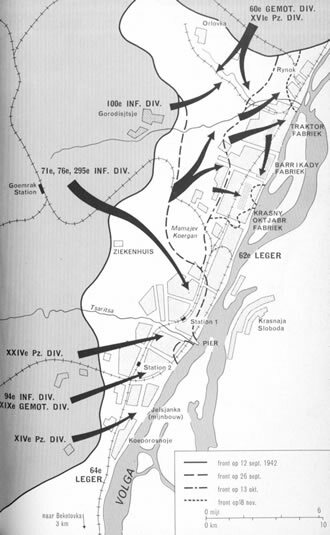 It is true that in the last analysis, Hitler and his generals “failed to achieve victory over the Soviet Union because of its vast manpower and industrial resources as well as its ability to force the Germans into fighting an attritional battle over a particular objective” (Stalingrad 1942 by Peter Antill). While these facts undoubtedly contributed to the eventual defeat of the German armies, the issue of leadership itself still remains key to understanding the outcome of the battle. At the beginning of the war, neither the size of the Soviet Union's armies, nor its resources, nor its great distances prevented German forces from penetrating right into the heart of the Soviet Union, nearly capturing Moscow and actually taking most of Stalingrad. The reason is not hard to fathom. As Antill says: “The Red Army had been effectively decapitated just before the outbreak of the Second World War by the Great Purge enacted by Stalin…. At least 30,000 officers were imprisoned, tortured or executed with the victims including three out of the five marshals and 14 out of the 16 army commanders.” One of those executed in 1937 was the civil war commander in the Red Army under Trotsky, Mikhail Tukhachevsky, Soviet chief of staff in the 1920s. Tukhachevsky was also a notable military theorist. Stalin still nursed the illusion that Hitler would not attack the Soviet Union, in the face of massive evidence to the contrary, even as German forces massed along the border. He rejected the reports from his own intelligence networks, in particular Richard Sorge in Japan and Leopold Trepper’s “Red Orchestra” which operated within occupied Europe and Nazi Germany itself, that Hitler was planning to invade the Soviet Union in June 1941 in operation Barbarossa, the biggest military operation of all time. As a result, over two million Soviet troops were killed or captured and German forces got so close to Moscow that they could see the city’s skyline. But, as Jones, who conducted battlefield tours of Stalingrad for five years, remarks, “in the attempt to remove horror and doubt and paint a picture of triumphal certainty, much more was lost than gained”. His aim in this book is to “remove the layers of revisionism [which] cover the terrain of battle”. Jones focuses on 62nd Army commander Vasily Chuikov, who led the battle to cling on to the west bank of the Volga river, where the Germans and Soviets fought within the ruins of what had been a major industrial city. Fascinatingly, he points to very different views of the same person by Beevor and Richard Overy in his account Russia’s War. Beevor describes Chuikov mainly as “ruthless” and holds him responsible for the execution of thousands of Soviet soldiers at Stalingrad. Historian Paul Overy and Chuikov’s own soldiers disagree and newly released NKVD (Stalin’s secret police) documents have borne them out. The execution rate for cowardice was far lower within the 62nd Army than for the Stalingrad Front as a whole. Back in 1919 during the Civil War, Tukachevsky had praised the young officer in the war against the White Army in Siberia. Mereshko points to the way that Chuikov was “always open to new tactical ideas – but he also tried to draw on his experience in the Civil War for the close quarters fighting at Stalingrad”. Extraordinarily, many of the innovations, which Tukachevsky had sought to make in the Red Army, such as his concept of a professional mass army and on military strategy, particularly on the use of tanks and aircraft in combined operations, re-emerged in the strategies adopted by both the Germans and Chuikov himself. Chuikov continued his studies at the Frunze Military Academy and was appointed to the staff of the Far Eastern Army under the outstanding Civil War leader Vasily Blyukher, who was arrested in Stalin’s army purges, tortured and is believed to have died after refusing to make a confession. By bringing his forces closer to German positions (something he had learned from an anti-tank gunner who found himself in no-man’s land) Chuikov realised that German air superiority could be beaten by his men being so near the frontline that the Germans would be reluctant to send in their planes for fear of hitting their own men. Veterans like Mikhail Serbryakov, Anatoly Mereshko and Mikhail Borchev, who were interviewed by Jones, have described how dramatically things changed under Chuikov’s leadership when he introduced a unique spirit of equality and unity within the army. Chuikov’s distrust of blueprints, his flexibility and fresh approach psychologically gave the defenders “reason to hope again”. Chuikov made up for his army’s weaknesses by encouraging a spirit of combat initiative, introducing new units such as small storm groups. While being tough on discipline, he also trusted his soldiers, thereby again transforming morale. He led from the front, breaking regulations by having his HQ extremely close to the enemy’s lines. Without these skills and qualities and those of other leaders like Alexander Rodimtsev, the 36-year-old commander of the 13th Guards Rifle Division, the desperate odds faced by the defenders between 13 and 14 September 1942 in the fight for the Central Railway Station and control of Mamayev Kurgan would have meant certain defeat. Indeed, Rodimtsev’s guards took almost 100% casualties crossing the Volga to come to the rescue of the 62nd Army. When the Germans took control of the famous Mamayev Kurgan hill, which was seen as the key to the city, the 62nd Army only had enough ammunition for one day’s fighting in the city, while the 6th Army under General Friedrich Paulus expended 23 million rifle rounds, 750,000 mortar shells, 685,000 tank and infantry artillery shells, plus 178,000 hand grenades. 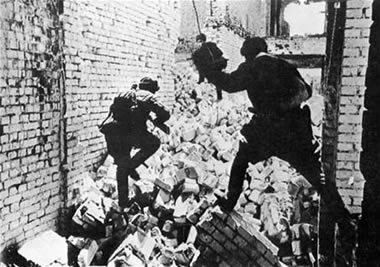 That day, the NKVD, who had been appointed by headquarters to be in charge both as soldiers and police, were unable to withstand the German offensive. When Chuikov arrived he challenged General Yeremenko’s (who led the counter-attack on Stalingrad) orders, Jones writes, “insisting that the NKVD forces be subordinated to his own authority”. The NKVD colonel Sarayev backed down. The NKDV’s “blocking detachments” responsible for preventing retreat, sometimes by shooting their own side, were now under the divisional commander’s authority. Jones’ interviews with battle veterans have shown that the Soviet position was far worse than has been previously known. It was at this point that the opening scenes of Enemy at the Gates took place in reality. Troops were sent from the east bank to cross the Volga to the west in daylight. This was virtually a death sentence as they were easy targets for German planes. Those who were there later recounted the raw truth. 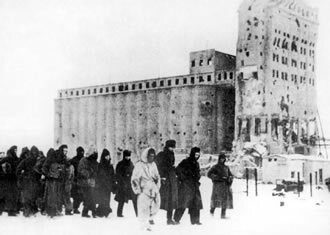 The near-suicidal conditions of repeated battles to wrest control of the Mamayev Kurgan hill, the grain elevator and other key positions in Stalingrad are well documented. Not just once, but again and again. On 22 September 1942, the Germans launched another assault on the 62nd Army. The 13th Guards defied this, although they were pushed to within 200 metres of the Volga. An ill-conceived counter-attack by the other Soviet armies had been destroyed by German air power, thus leaving the 62nd Army with their rifles divisions to fight entirely on their own. Enemy at the Gates shows something of the ferocity of the battle and the vulnerability of the young men who were thrown into the line of fire, most of them lacking even the ammunition to fight back. Chuikov’s original idea of a “storm troop group” took hold amongst the soldiers and became increasingly popular. It relied on taking the enemy by surprise by preying on the German’s dislike of night fighting and close combat. Through short bursts of concentrated hand-to-hand fighting at which Stalingrad’s defenders became increasingly skilled, fighting for the city on a house-to-house – or rather ruin-to-ruin – basis. In the central thrilling chapters of his book, Jones shows how Chuikov, Rodimstev and defenders like Jacob Pavlov (of the famous Pavlov house), Georgi Potanksi, Anton Dragan, and a Captain Naumov developed these new ways of fighting under conditions of absolute desperation. They made key positions like Pavlov’s house into part of an integrated defence system using artillery spotters and supporting artillery fire. In this decentralised network of fighters, rank-and-file soldiers began to feel their own strength and influence in changing the course of history. Chuikov had coined a new slogan – “Every man a fortress”. There was also the quite spontaneous rise of sniperism, later attributed to a young Communist Vasily Zaitsev by Stalinist propaganda. But according to Nikolai Aksyonov, who actually was in Zaitsev’s division, it was a Siberian soldier of humble origins, Alexander Kalentiev, who began the sniper movement, which in turn inspired Zaitsev. Chuikov was astute enough to incorporate the enthusiastic but out-of-control amateurs into his forces, thereby transforming a potential danger into a disciplined asset, which lifted morale and haunted the enemy. Despite the improved morale, losses were staggering. 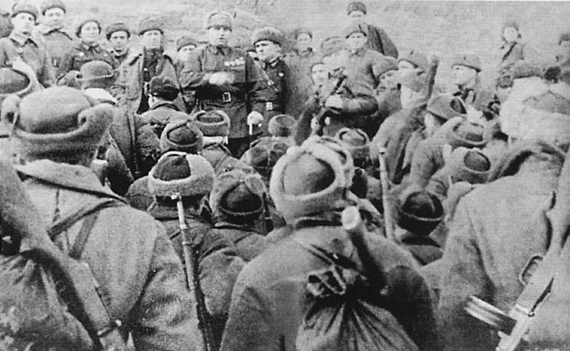 General Feodor Smekhotvorov’s 193rd Division, which reached the Volga on 27 September, was reduced from 5,000 troops to 600 men by 1 October 1942. Life expectancy for soldiers in the frontline was reduced to one day. The strain on staff became simply too great. In response, Smekhotvorov introduced a democratic process of rotating regimental commanders in consultation with their men, which prevented the collapse of leadership. Paulus’ 6th Army’s third huge assault on Soviet positions on 14 October opened the most crucial phase of the battle. Jones says the overall strength of the 62nd Army has been overestimated. He quotes Mereksho’s estimate: “Paulus… had between five and six times as many infantry and twelve times as many tanks.” With their mighty air support the Germans carried out precision bomb attacks, followed by heavy artillery. They dropped one tonne bombs on the Soviet command posts pinpointed through radio intercepts, which was the only form of communication left to the defenders. There was now a crisis of command, which according to Jones has remained hidden in all accounts of the battle. He quotes a dramatic communication from Chuikov made at 9.40pm to the Stalingrad Front headquarters, asking for permission to move to the east bank of the Volga – anathema to the leadership which expected him to stay and die. Permission was refused. He believes Chuikov may have been dismissed as commander after a conflict on the telephone with Khrushchev – who was Stalin’s political overseer – and temporarily replaced by his chief of staff, Nikolai Krylov. The next day Chuikov made a second request for sections of the Army HQ to move to the left (east) bank of the river. This was also denied. But now a fresh division was provided to help defend the city. In the Stalin era, it could never be openly admitted that the city might have fallen to the enemy. But amongst his closest family and comrades, Chuikov was “honest about the desperation he and his remaining HQ staff now felt”. Alexander Rakitsky, the sole surviving witness to the crucial Army Council meeting of 14 October 1942, recalled that Chuikov paid tribute to Zholudev who “had held firm whilst he (Chuikov) had lost hope”. Survivors recount how at this meeting the defenders took an oath on the anniversary of the October Revolution. Rituals now became a way of life and a strange gallows humour and slang was so widespread that it became a common language. “Code names and instructions now identified divisional and regimental commanders by the type of wood they used for their dug-out doors, and mischievously promised the enemy some Russian hospitality,” Jones writes. 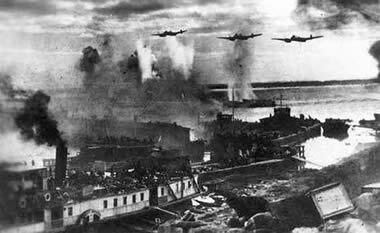 By 19 November 1942, when the Soviet counter-offensive began, their hold on the city was reduced at some points to a strip of land along the Volga less than 200 metres wide. Chuikov’s forces were left to face the vastly bigger German forces virtually on their own. Meanwhile Zhukov and Vasilevsky were preparing a wider encirclement of the Paulus’ army, while Chuikov’s forces acted as “bait”. Eventually, when the 6th Army was encircled and forced to surrender, German casualties for the city were almost 300,000, including 35,000 wounded evacuated, 100,000 captured and 150,000 killed) with another 300,000 casualties suffered by Army Groups A, B and Don. The German High Command always had to defer to Hitler while the Soviet generals eventually wrested military control away from Stalin. This had proved decisive. Jones explains in the closing chapters that on the 50th anniversary of the battle, the Volgograd (Stalingrad) veterans’ association took the decision to tell the truth about Stalingrad. Anatoly Kozlov, head of the association, helped him assemble the unique accounts by 34 male and female veterans of the battle which help to explain how the 62nd Army managed to fight its way through the firestorm that was Stalingrad. How the Red Army Triumphed gives voice to those who had actually been there, veterans whose days are now numbered, and in doing so penetrates behind the propaganda and mythology. Another historian, David Glantz, has described how previous Soviet histories, while often formidable and even candid, were distorted by what he describes as “communist requirements”. In fact, the Stalinist propaganda machine which, amongst many other lies, elevated the accomplishments of the “Great Russian” divisions at the expense of Ukrainians, Byelorussians, Poles, and the many other nationalities within the Red Army. But it is an intriguing fact, that even accounts published in the Soviet Union as early as 1970, such as that of Marshall Konstantin Rokossovky (born in Velikiye Luki, a Polish possession of Tsarist Russia, and imprisoned during Stalin’s purges before the war) already indicated the unpreparedness of the Soviet forces and the serious disagreements between those on the ground and the orders coming from above. The memoirs of Marshall Georgi Zhukov also showed how at every twist and turn even the greatest Soviet general came into major and repeated conflict with Stalin over strategic issues. After the war was over, Zhukov kept a packed suitcase ready at all times in case he was arrested and sent to prison by a jealous Stalin. 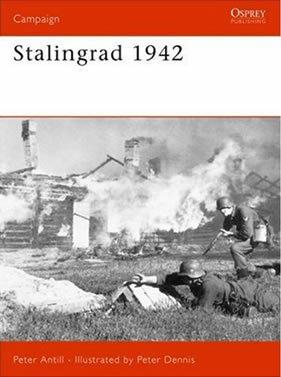 Western historians began to write about Stalingrad in the 1970s in a series of books, which culminated in Beevor’s bestseller, but even his superb book relied on these earlier accounts by the Soviet generals. Glantz describes Beevor’s account as a “skilfully constructed mosaic [crafted] on to a structure of 1970s vintage history”. In response to one critic, Beevor has said he was indeed hampered by the fact that the Russian government did not release the main archival records of the Stavka (general HQ). And thus, it has taken nearly six decades for the heirs of the Soviet Union’s history and others around the world to understand not only the horror of the battle, but also how and why Stalingrad’s defenders not only resisted but forced back the Nazi war machine. And so here, for the first time, certainly in English, we can read about the battle and how what still appears impossible, was achieved. By choosing to unravel the leadership issues Jones has taken on a monumental task. His account shows how leadership under extreme duress can find ways out of an apparently impossible situation. A new illustrated summary in the Campaign series also offers a chance to revaluate the balance of forces and the role of leadership on both sides.